The Wheaten is related with the Kerry Blue and the Irish Terrier. Over the last two hundred years, the breed has been flourishing not only in its home country of Ireland, but all over the world. They were originally farmer's dogs, used to patrol the land, herd sheep and hunt vermin. 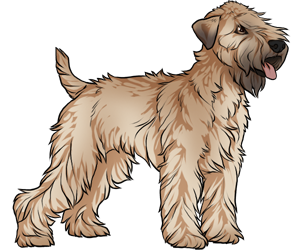 Wheatens will chase squirrels, rabbits, cars, and anything else that moves and were originally bred to hunt, herd and guard. Soft Coated Wheaten Terriers were registered by the AKC in 1973. An alternative name is Teddy Bear.